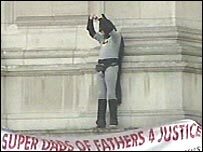 A Fathers 4 Justice campaigner dressed as Batman is staging a protest on the Buckingham Palace balcony. Jason Hatch, 33, entered the grounds and scaled a wall at 1420 BST. Police moved a crane and crash mat beneath the ledge at 1733 BST and a police officer wearing a harness and helmet is at the balcony window. The Metropolitan Police Commissioner Sir John Stevens said if officers at the scene had judged the intruder a terrorist he would have been shot. He has also described the security breach at the Palace as "unacceptable". Sir John said police made a split-second judgement that Mr Hatch was not a security risk because of the way he was behaving and the clothes he was wearing - and for this reason they did not open fire. The latest broaching of palace security follows other incidents, including one in which a reporter got a job as a royal servant. In addition, Prince William's 21st at Windsor Palace was gatecrashed. And it is the latest in a series of high-profile stunts by Fathers 4 Justice costumed campaigners who have protested on the London Eye and the Church of England General Synod in York. A police helicopter circled overhead as scores of people, including some protesters, gathered to watch from behind a police cordon. The lone protester waved as some among the perhaps two dozen supporters mingling in the media scrum cheered and blew claxons. Mr Hatch, from Cheltenham, Gloucestershire, stood on a ledge to the right hand side of the main balcony and unfurled a banner which read "Super dads of fathers 4 justice". He is believed to have two children, aged four and five, whom he has not seen for several years and is thought to have taken part in the York protest. Also on the banner are the words: "Fighting for your right to your kids". A group of Fathers 4 Justice campaigners are believed to have distracted police by climbing the front gate, while Mr Hatch climbed over the outer fence. 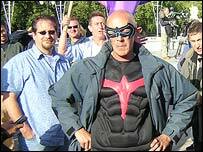 Fellow protester Dave Pyke, 48, dressed as Batman's sidekick Robin but was stopped by armed police, who allegedly threatened to shoot him, as he tried to scale the fence. He told BBC News Online: "We are totally untrained, just ordinary guys and if we can get in there, anybody can get in there." Mr Pyke added: "I thought I would be pounced on by the police. I went over to the park and put on a coat and cap and came back," he said. He was later arrested police as he gave an interview to Sky News. Group spokesman Matt O'Connor said the incident was to highlight Monday's court appearance of a campaigner accused of staging a flour-throwing protest in the House of Commons. "This is planned to coincide with the trial of Ron Davis and the fun powder plot. I've literally come from the trial at Bow Street Magistrates today." The Queen was not at the Palace as she is at Balmoral in Scotland, a palace spokeswoman said. Fathers 4 Justice was set up by fathers who have either no access, or very limited access to their children, and feel they have been treated unfairly by courts. Home Secretary David Blunkett is expected to make a statement on the incident to MPs on Monday evening. Royal security was reviewed after Daily Mirror reporter Ryan Parry got a job at Buckingham Palace as a servant before President Bush stayed there last November. A report was published a year ago into the breach of security during Prince William's 21st birthday party at Windsor Castle. Comedian Aaron Barschak set off six alarms and appeared on CCTV several times without sparking a response when he gatecrashed the party at the castle, it found. "Today's breach comes just nine months after another embarrassing incident"